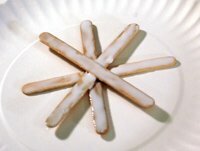 This pretty wooden snowflake is a very simple craft, easy enough for a preschooler to make by themselves. 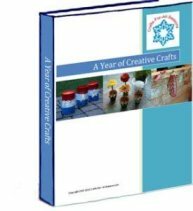 This child’s craft looks wonderful hanging in a window. It can also be used as an ornament for the Christmas tree. 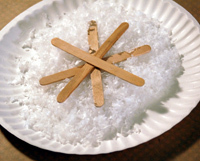 All you need is popsicle sticks, glue, and some fake snow. 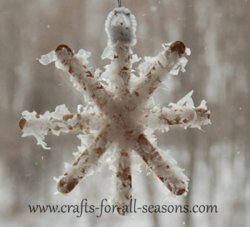 Fake snow can be bought in craft stores, although it is sometimes only sold during the winter months. 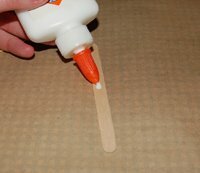 Glue can be added to a small cup and a Q-tip can be used for spreading if the child is very small and has trouble squeezing glue from the larger bottle. 1. 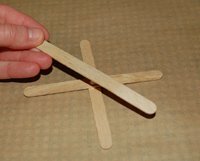 Begin by placing a drop of glue in the middle of one of the popsicle sticks. 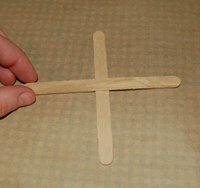 Place another popsicle stick on top of it perpendicular, to make a cross. 2. 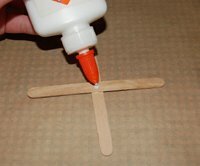 Place a drop of glue on the center of the cross, and lay another popsicle stick on top of the cross, lying at a 45 degree angle from the other sticks. 3. 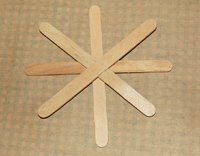 Add another drop of glue to the middle of the top stick, and add the last popsicle stick to finish making the snowflake. 4. 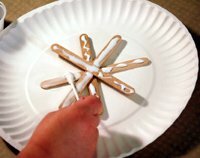 Add a thick layer of glue to one whole side of the snowflake. Cover everything well. 5. 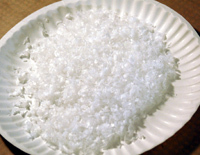 Pour some fake snow onto a paper plate. 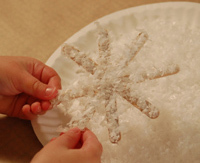 Have the child place the snowflake, glue side down, into the snow, then pick it up and turn it over to allow to dry. 6. If you want a thicker layer of snow, repeat the process by adding more glue on top of the layer of snow, and dip it again in the snow. 7. When the snowflake is completely dry, use a pipe cleaner to wrap a loop for hanging, on the top of one of the sticks. Just wrap the pipe cleaner around the stick a few times, then form it into a small loop, and finish by wrapping the rest of the pipe cleaner around the stick once again. You can secure it with a little glue, but in most cases this is not even necessary since the snowflake is so light. 8. Add a ribbon or cord for hanging. The child’s name and year can be written in marker on the back of the snowflake.